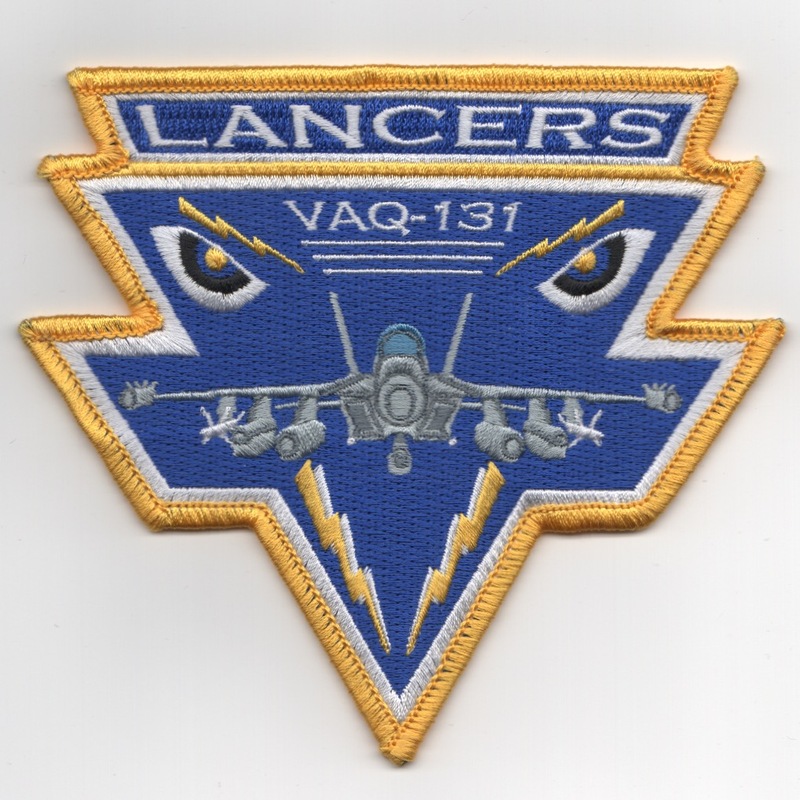 This is the dark blue version of the current squadron patch with a black border for the VAQ-131 'Lancers' that now fly the EA-18G Growler out of NAS Whidbey Island, WA. They currently (2015) fly with Airwing Two off the USS Ronald Reagan (CVN-76) currently. This patch does NOT come with velcro already attached, but can send some if you need. 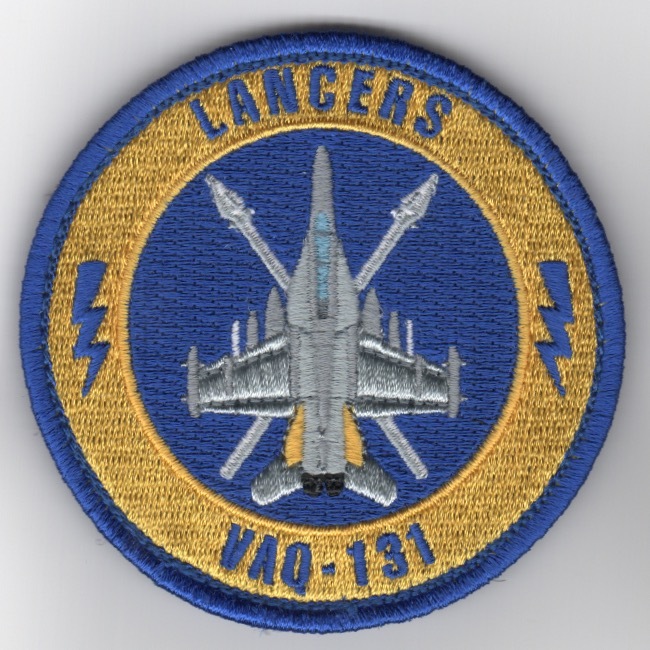 This is the dark blue version of the current squadron patch with a yellow border for the VAQ-131 'Lancers' that now fly the EA-18G Growler out of NAS Whidbey Island, WA. They currently (2015) fly with Airwing Two off the USS Ronald Reagan (CVN-76) currently. This patch does NOT come with velcro already attached, but can send some if you need. 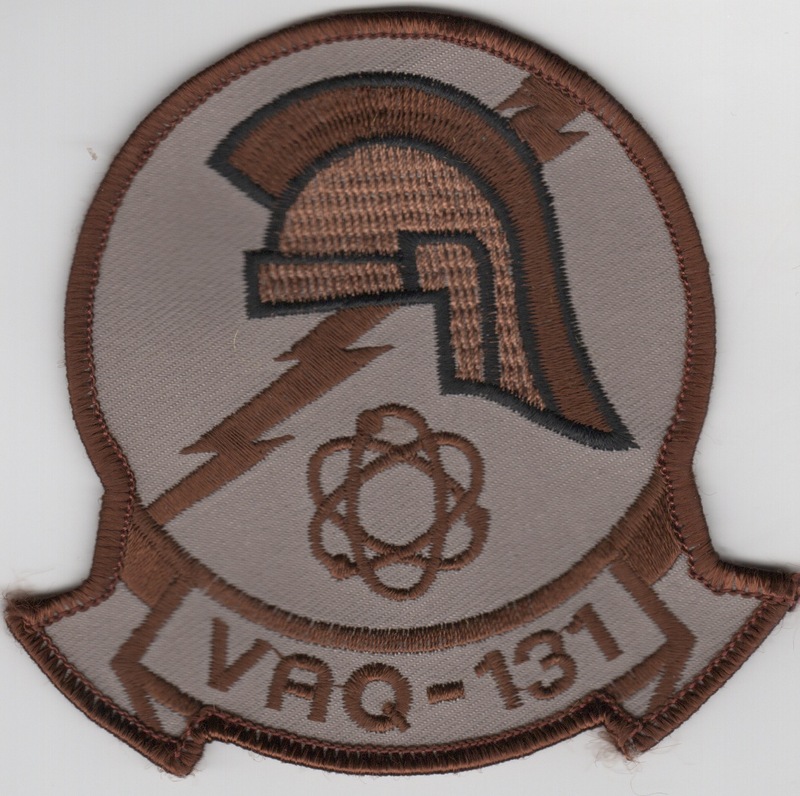 This is the desert version of the current squadron patch for the VAQ-131 'Lancers' that now fly the EA-18G Growler out of NAS Whidbey Island, WA. They currently (2015) fly with Airwing Two off the USS Ronald Reagan (CVN-76) currently. This patch does NOT come with velcro already attached, but can send some if you need. 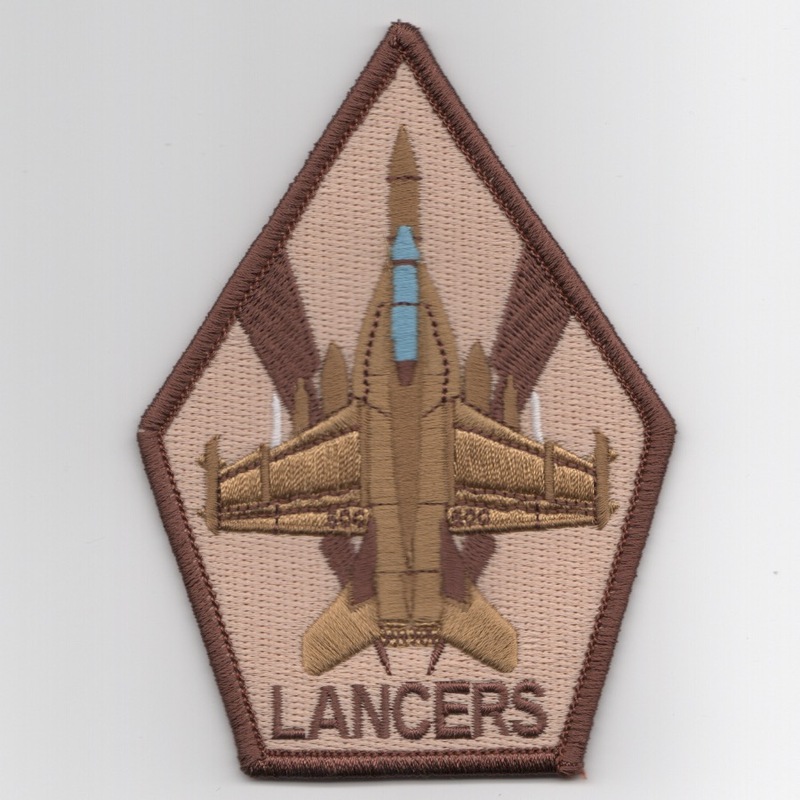 Another AV8RSTUFF creation: This is the "GOLD HELMET" version of the current squadron patch with a gold-thread border for the VAQ-131 'Lancers' that now fly the EA-18G Growler out of NAS Whidbey Island, WA. They currently (2015) fly with Airwing Two off the USS Ronald Reagan (CVN-76) currently. This patch does NOT come with velcro already attached, but can send some if you need. 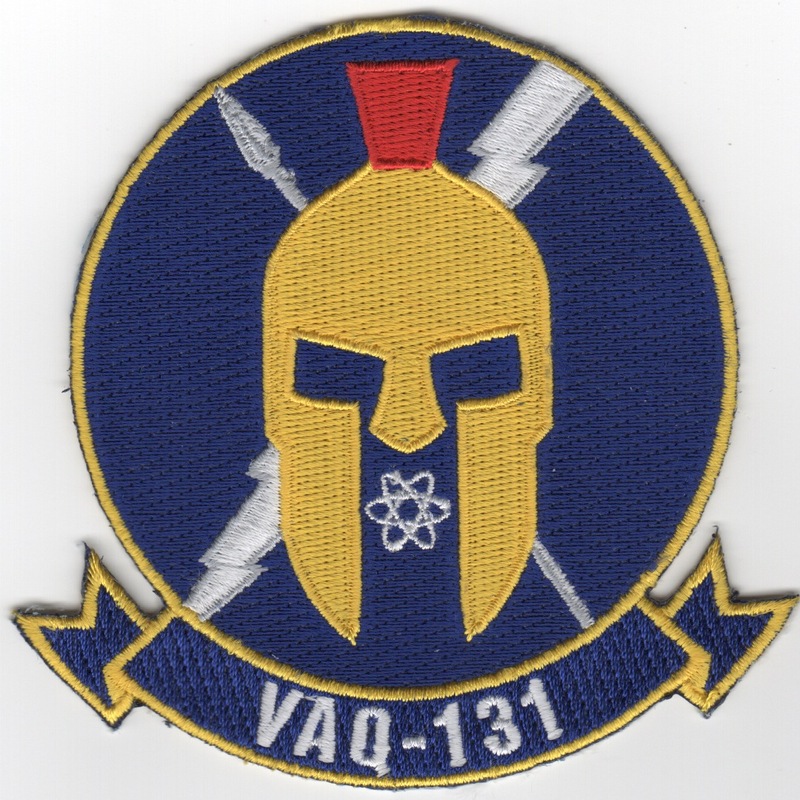 Another AV8RSTUFF creation: This is the dark blue version of the squadron patch WITH the atomic symbol for the VAQ-131 'Lancers' that shows a yellow "SPARTA" mask. They now fly the EA-18G Growler out of NAS Whidbey Island, WA and currently (2015) fly with Airwing Two off the USS Ronald Reagan (CVN-76) currently. This patch does NOT come with velcro already attached, but can send some if you need. 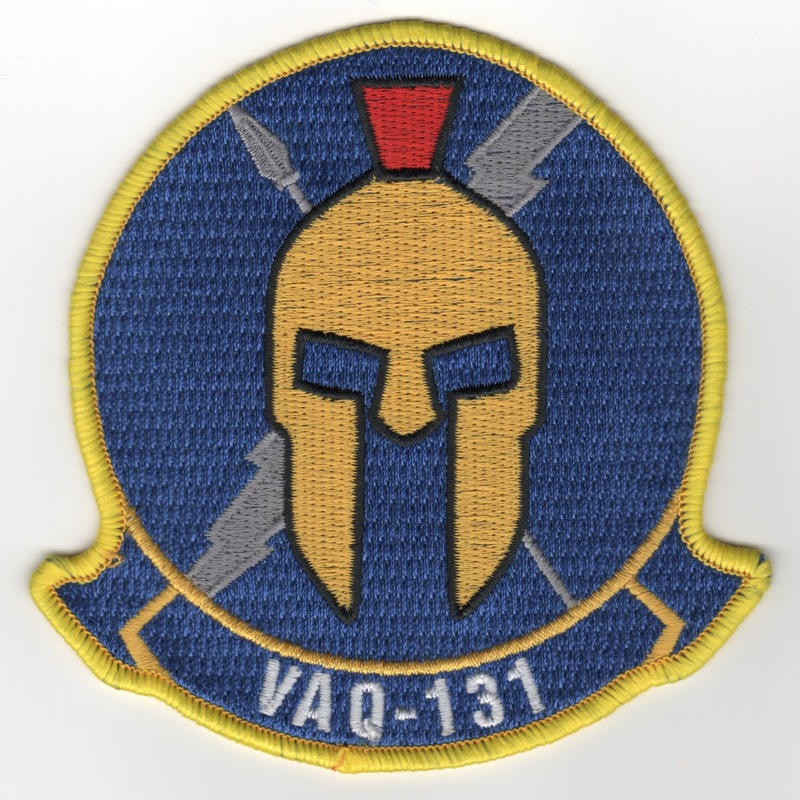 Another AV8RSTUFF creation: This is the dark blue version with the YELLOW border/mask of the squadron patch WITHOUT the atomic symbol WITH white lightning bolts with gray borders AV8RSTUFF created for the VAQ-131 'Lancers' that shows the front view of a yellow "SPARTA" mask. They now fly the EA-18G Growler out of NAS Whidbey Island, WA and currently (2015) fly with Airwing Two off the USS Ronald Reagan (CVN-76). This patch does NOT come with velcro already attached, but can send some if you need. 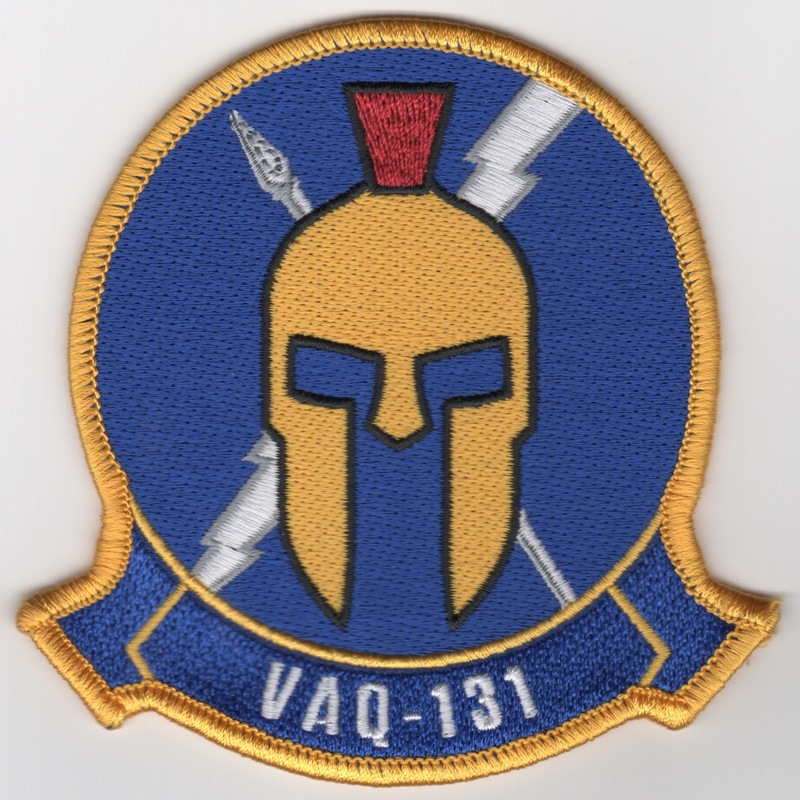 Another AV8RSTUFF creation: This is the dark blue version with the YELLOW border/mask of the squadron patch WITHOUT the atomic symbol WITH all-gray lightning bolts AV8RSTUFF created for the VAQ-131 'Lancers' that shows the front view of a yellow "SPARTA" mask. They now fly the EA-18G Growler out of NAS Whidbey Island, WA and currently (2015) fly with Airwing Two off the USS Ronald Reagan (CVN-76). This patch does NOT come with velcro already attached, but can send some if you need. Another AV8RSTUFF creation: This is the yellow/blue version of the new EA-18G Growler 'EYES' triangle patch showing the E/A-18 'GROWLER' coming straight at you (vs. the old version of the Prowler Planform), says "LANCERS" across the top, and does not have velcro. Another AV8RSTUFF creation: This is the yellow/blue version of the new EA-18G Growler 'Coffin' Patch and does not have velcro. 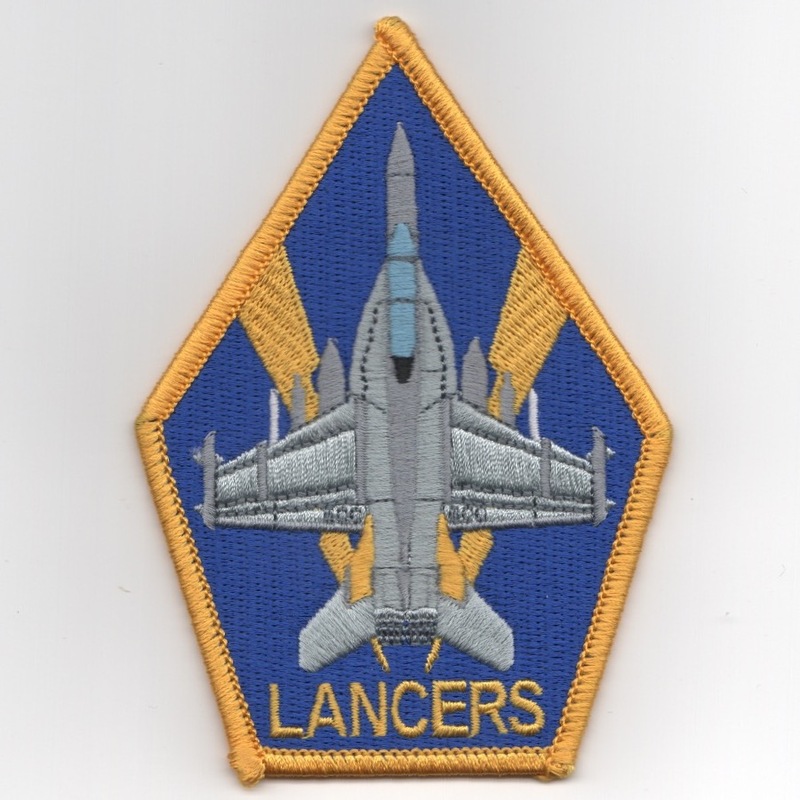 Another AV8RSTUFF creation: This is the blue/yellow version of the EA-18 aircraft "bullet" patch for the VAQ-131 'Lancers' that now fly the EA-18 Growler out of NAS Whidbey Island, WA. This patch does have velcro already attached. 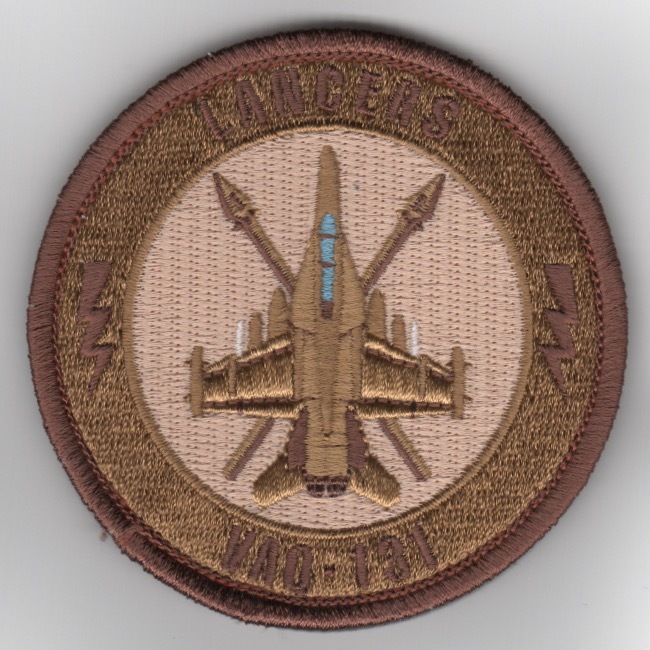 This is the color version of the EA-6B aircraft "bullet" patch for the VAQ-131 'Lancers' that flew the EA-6B Prowler out of NAS Whidbey Island, WA. 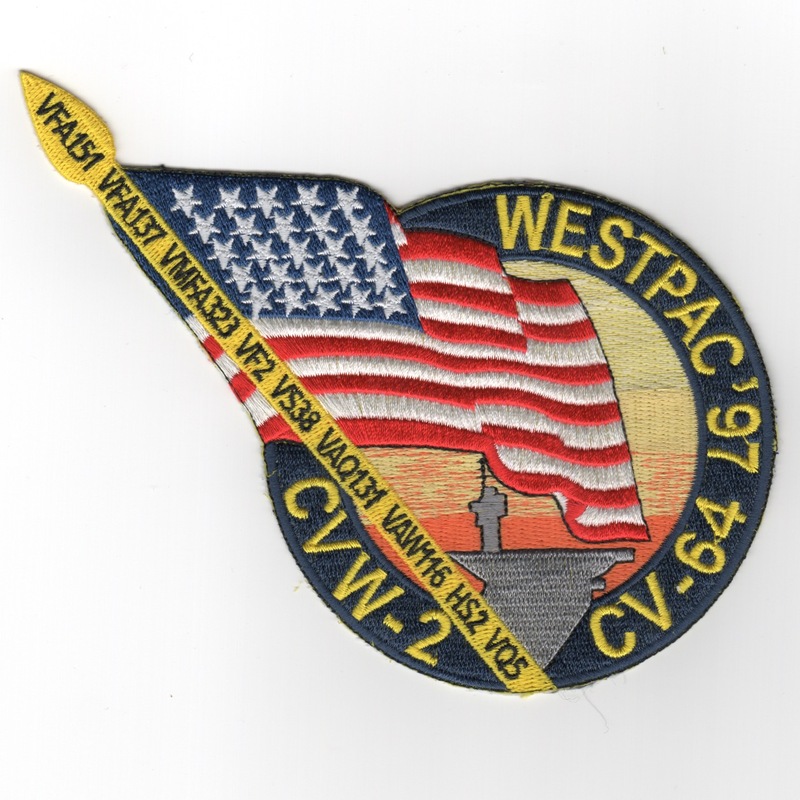 They flew with Airwing Two off the USS Constellation (CV-64). This patch does NOT come with velcro already attached. 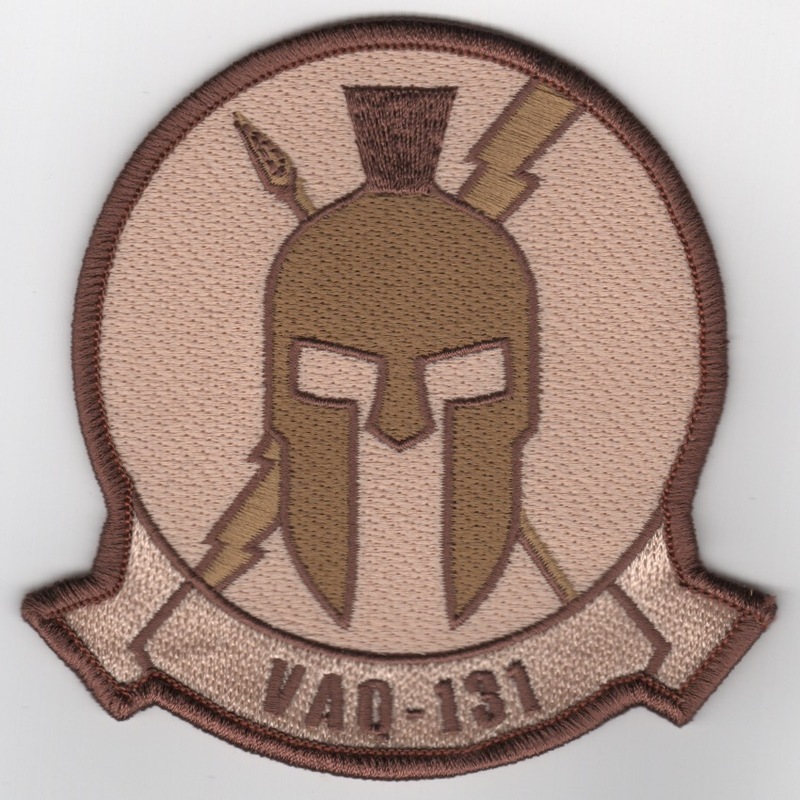 Another AV8RSTUFF creation: This is the desert version of the squadron patch WITHOUT the atomic symbol for the VAQ-131 'Lancers' that shows a yellow "SPARTA" mask. They now fly the EA-18G Growler out of NAS Whidbey Island, WA and currently (2015) fly with Airwing Two off the USS Ronald Reagan (CVN-76) currently. This patch does NOT come with velcro already attached, but can send some if you need. Another AV8RSTUFF creation: This is the desert version of the new EA-18G Growler 'Coffin' Patch and does not have velcro. Another AV8RSTUFF creation: This is the desert version of the EA-18 aircraft "bullet" patch for the VAQ-131 'Lancers' that now fly the EA-18 Growler out of NAS Whidbey Island, WA. This patch does have velcro already attached. 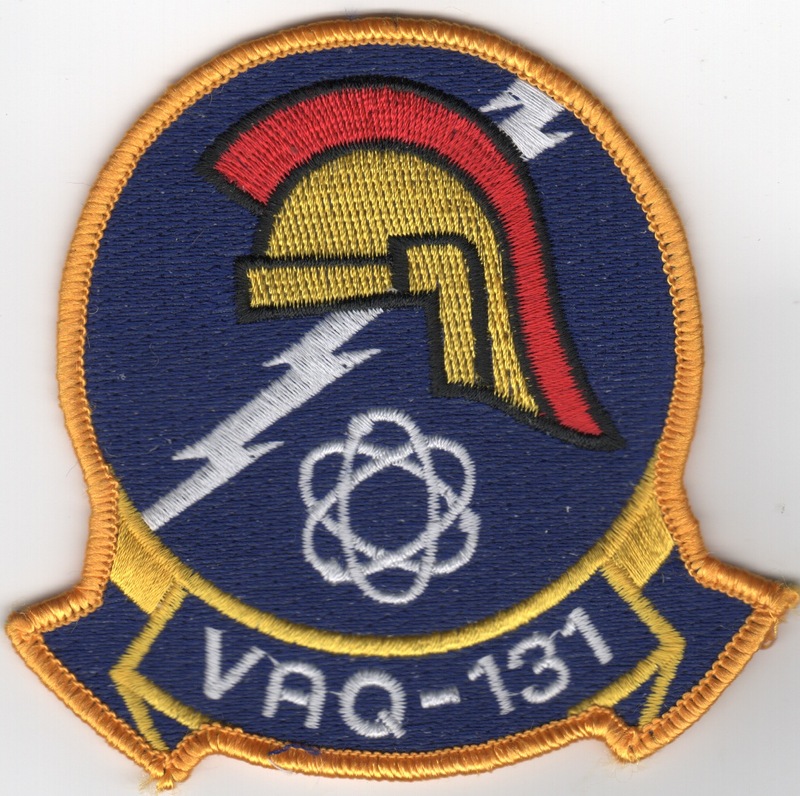 This is another version of a squadron patch for the VAQ-131 'Lancers' that now fly the EA-18G Growler out of NAS Whidbey Island, WA. It shows the Atomic Nuclear symbol in a "wedge" of orange. They currently (2015) fly with Airwing Two off the USS Ronald Reagan (CVN-76) currently. This patch does NOT come with velcro already attached, but can send some if you need. Another AV8RSTUFF creation: This is the "RED AIR" PILOT nametag worn by the VAQ-131 'Lancers' when they fly in the "adversary" role. They now fly the EA-18G Growler out of NAS Whidbey Island, WA. 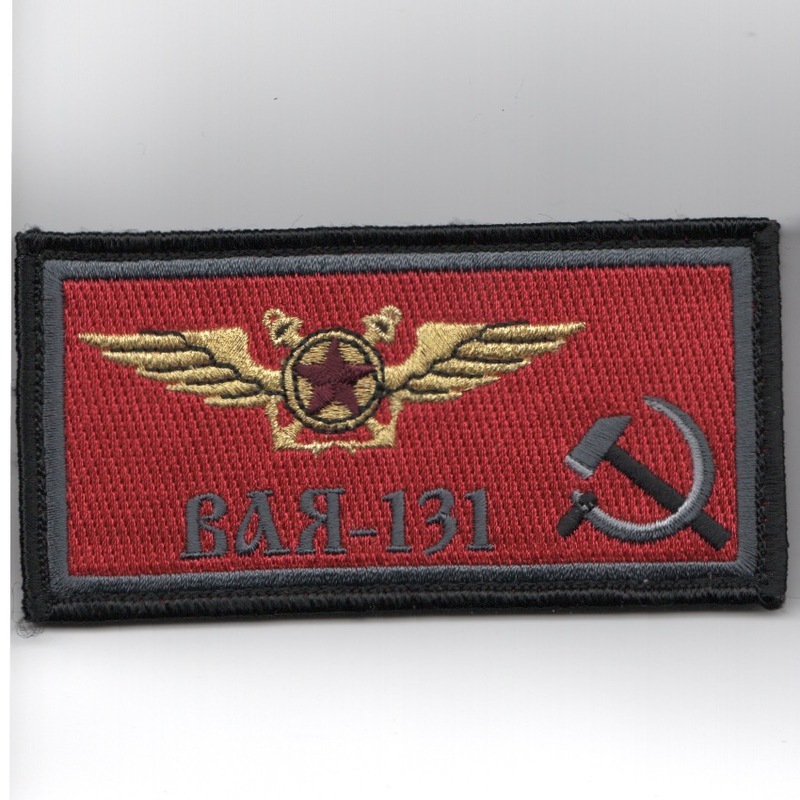 This nametag says (in Cyrillic language) 'VAQ-131' and does come with velcro already attached. Only have a few, so get them while they last!! Another AV8RSTUFF creation: This is the "RED AIR" NFO/WSO nametag worn by the VAQ-131 'Lancers' when they fly in the "adversary" role. They now fly the EA-18G Growler out of NAS Whidbey Island, WA. 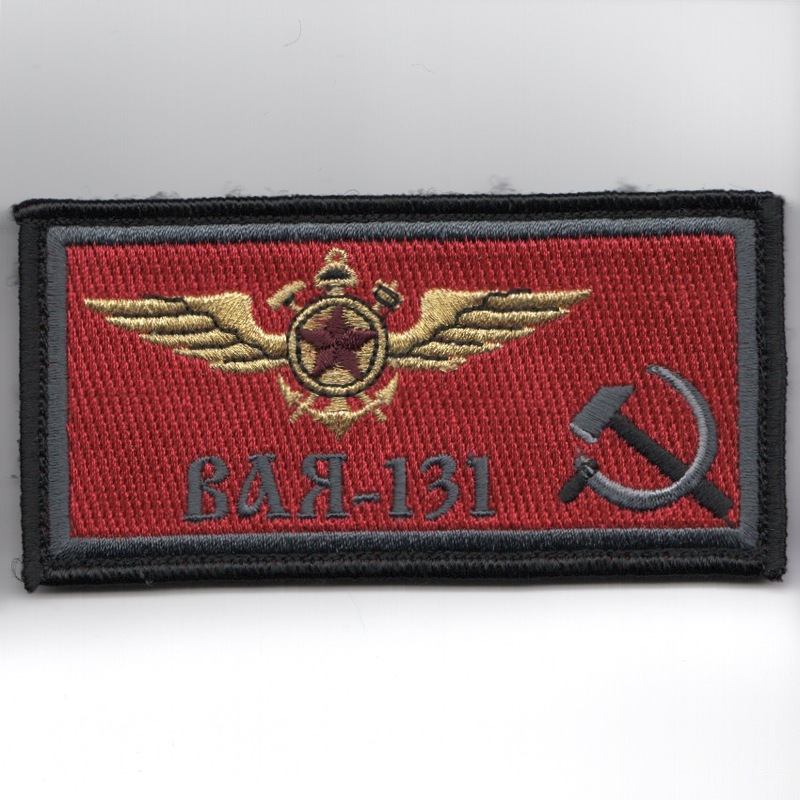 This nametag says (in Cyrillic language) 'VAQ-131' and does come with velcro already attached. Only have a few, so get them while they last!! 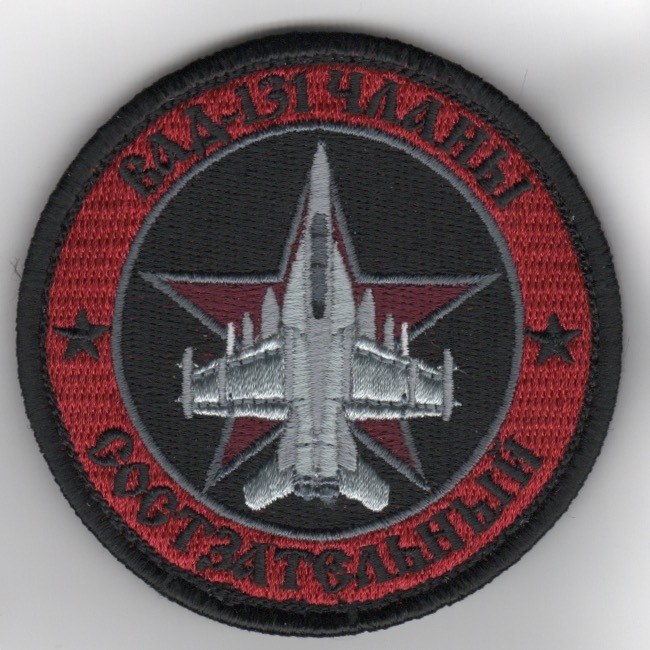 Another AV8RSTUFF creation: Use this link to get BOTH of the Pilot and NFO/WSO 'Red Air' Nametags that say (in Cyrillic language) 'VAQ-131'. Another AV8RSTUFF creation: This is the "RED AIR" PILOT nametag worn by the VAQ-131 'Lancers' when they fly in the "adversary" role. They now fly the EA-18G Growler out of NAS Whidbey Island, WA. 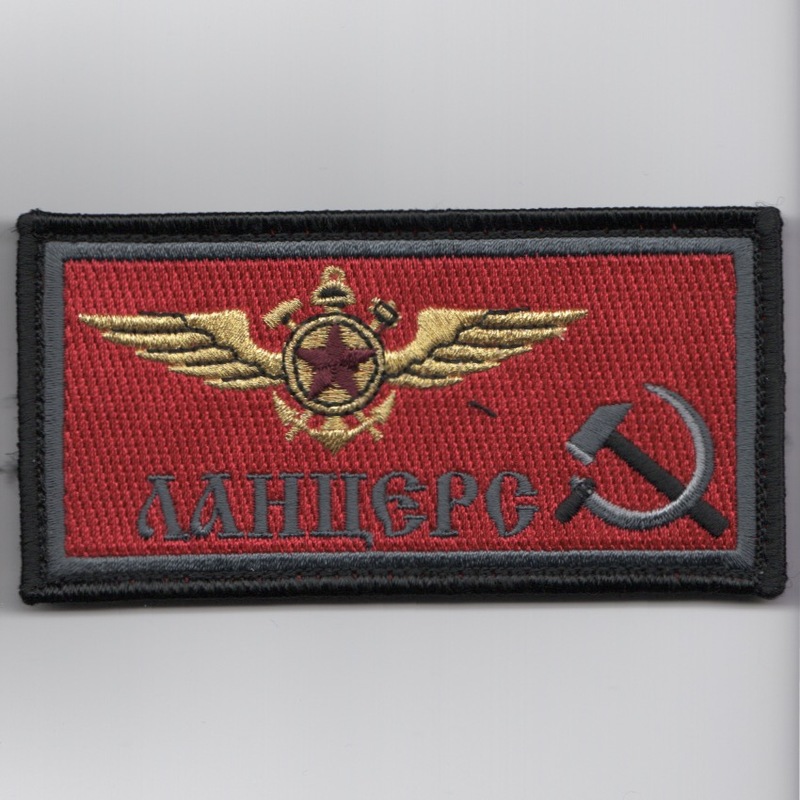 This nametag says (in Cyrillic language) 'LANCERS' and does come with velcro already attached. Only have a few, so get them while they last!! Another AV8RSTUFF creation: This is the "RED AIR" NFO/WSO nametag worn by the VAQ-131 'Lancers' when they fly in the "adversary" role. They now fly the EA-18G Growler out of NAS Whidbey Island, WA. 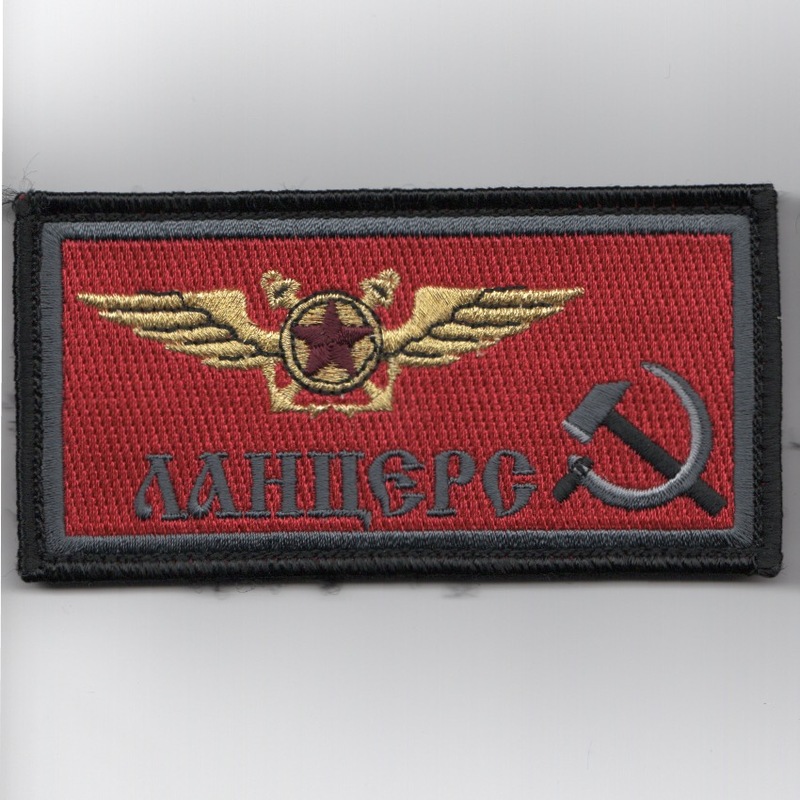 This nametag says (in Cyrillic language) 'LANCERS' and does come with velcro already attached. Only have a few, so get them while they last!! 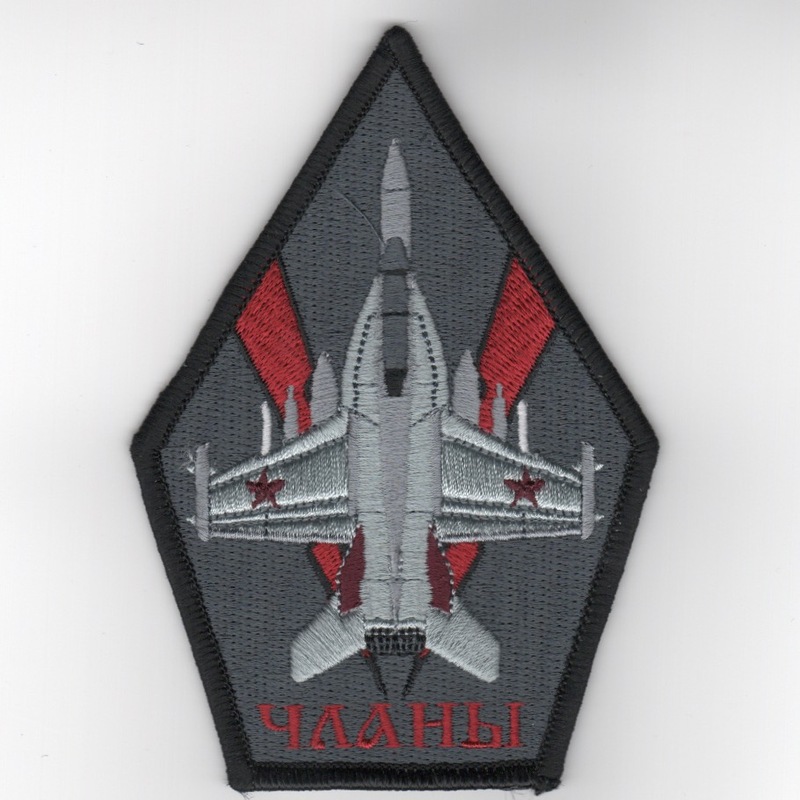 Another AV8RSTUFF creation: Use this link to get BOTH of the Pilot and NFO/WSO 'Red Air' Nametags that say (in Cyrillic language) 'LANCERS'. 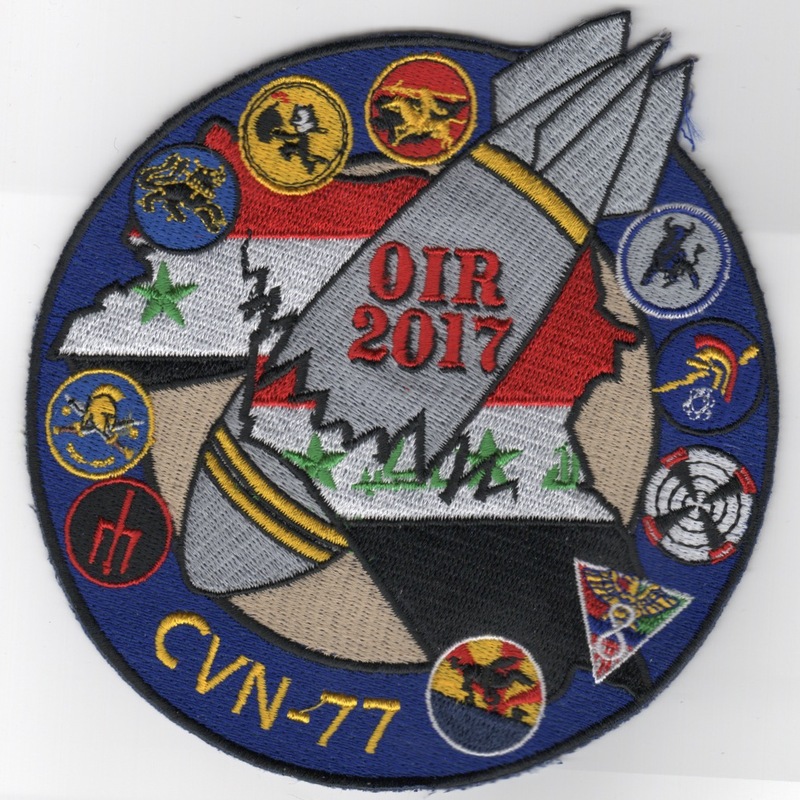 Another AV8RSTUFF creation: Use this link to get ALL FOUR of the Pilot and NFO/WSO 'Red Air' Nametags that say (in Cyrillic language) 'VAQ-131' and 'LANCERS'. Another AV8RSTUFF creation: This is the "RED AIR" version of the squadron patch worn by the VAQ-131 'Lancers' when they fly in the "adversary" role. They now fly the EA-18G Growler out of NAS Whidbey Island, WA and currently (2015) fly with Airwing Two off the USS Ronald Reagan (CVN-76) currently. This patch does NOT come with velcro already attached, but can send some if you need. Only have a few, so get them while they last!! Another AV8RSTUFF creation: This is the "RED AIR" version of the new EA-18G Growler 'Coffin' Patch and does not have velcro. Another AV8RSTUFF creation: This is the "RED AIR" version of the EA-18 aircraft "bullet" patch for the VAQ-131 'Lancers' that now fly the EA-18 Growler out of NAS Whidbey Island, WA. This patch does have velcro already attached. Use this link to order the set of THREE Red Air patches above to save 15%. 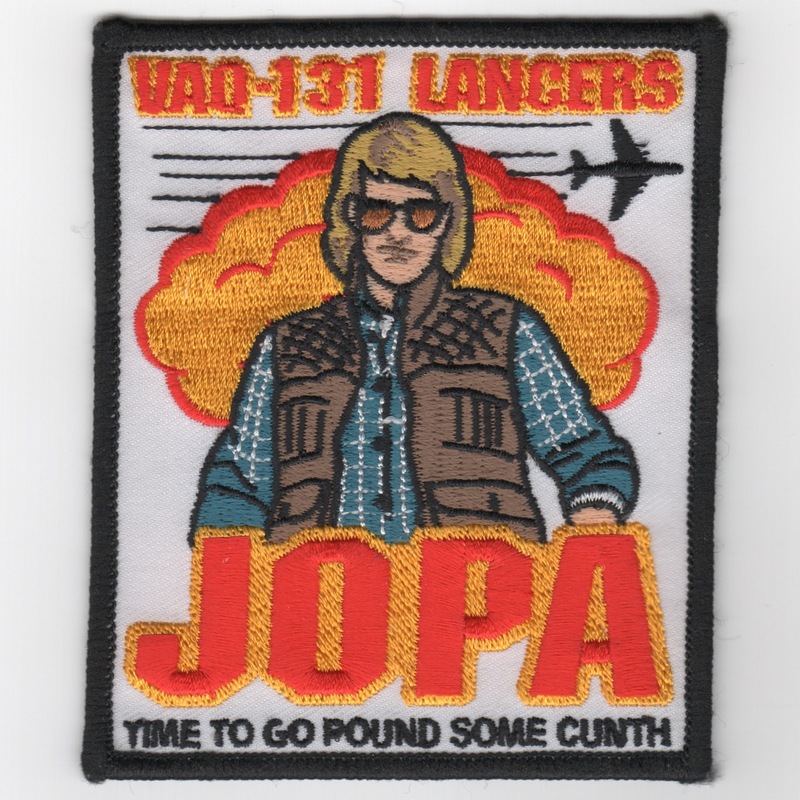 This is the Junior Officer Protection Agency (JOPA) patch showing an nuclear explosion in the background with a man walking away. It says "TIME TO GO POUND SOME CUNTH" which I'm unfamiliar with. This patch does NOT come with velcro already attached, but can send some if you need. It was purchased directly from the squadron Mess Officer. 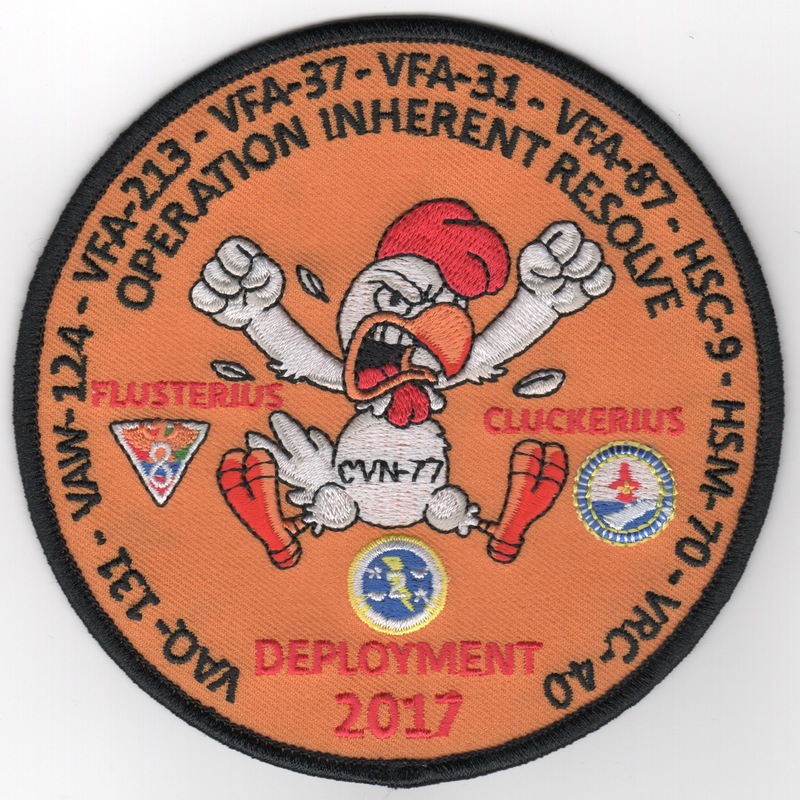 This is one of the 2017 OIR Cruise Patches for CVN-77, Airwing 8, and VAQ-131. It shows the 'Gaggle' of squadron logos with a bomb thru Iraq. Only received a few of these...... No velcro on back. 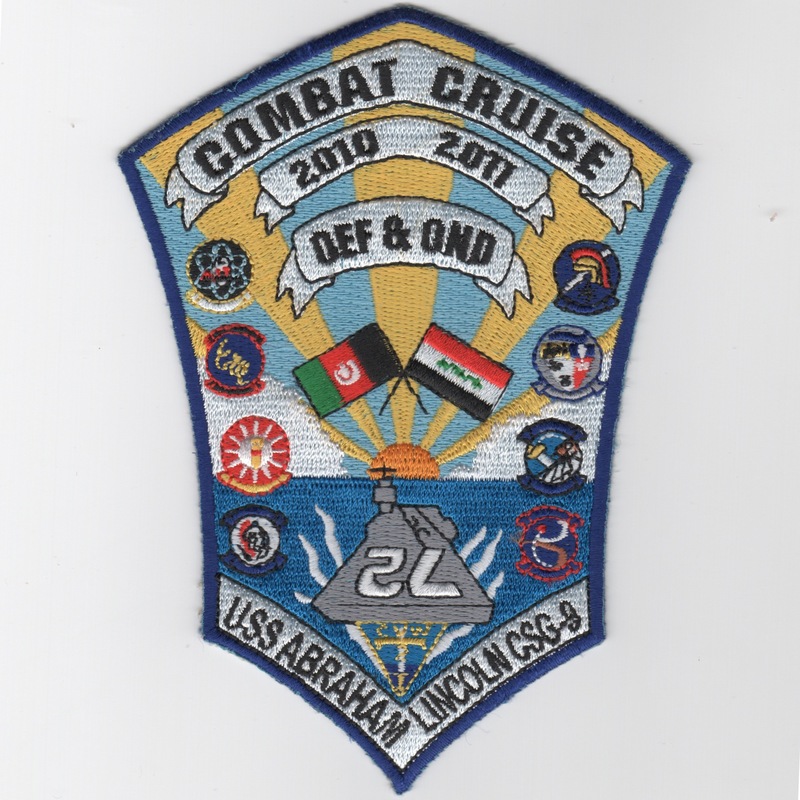 This is one of the cruise patches created for the CVN-72/CVW-2 2008 "SUPERCRUISE" Combat Cruise. 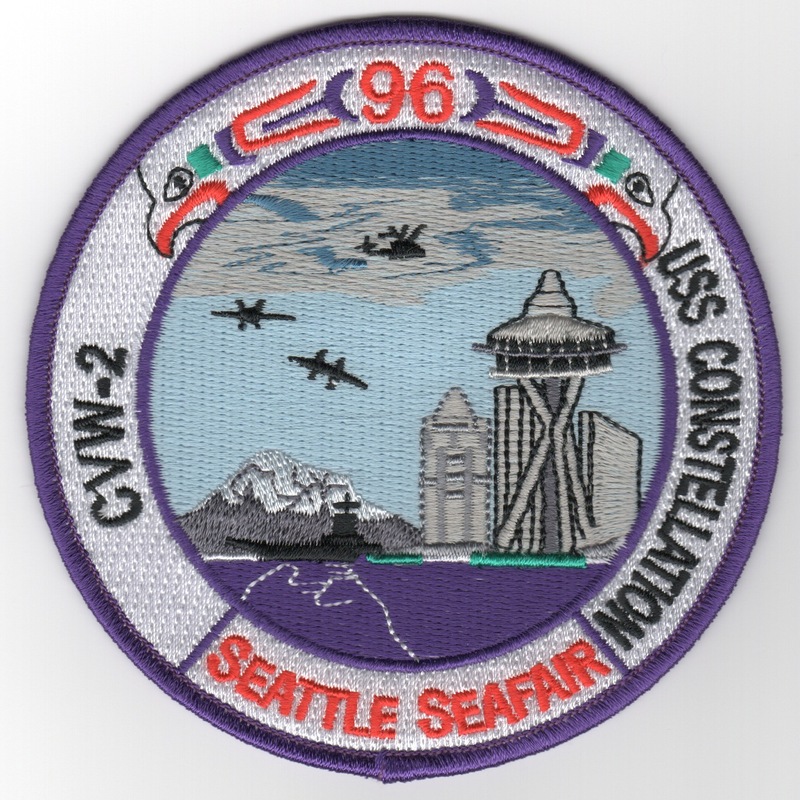 The patch shows the Lincoln and the various assigned squadrons. It states "Join the Navy . . . See the Lincoln" on it. 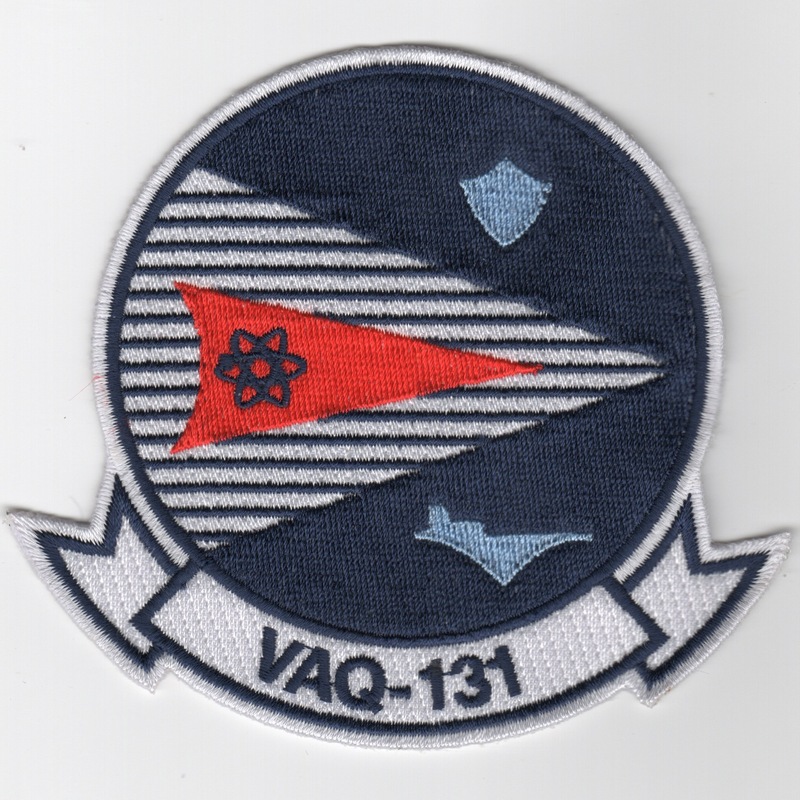 I was able to acquire all these cruise patches that VAQ-131 had to offer, so I'm able to offer them at a substantial discount since we were able to get a large quantity of them. This patch does not come with velcro, but can send a piece if you need. These patches were created by another vendor, but were purchased by me directly from the squadron, so they are as authentic as they come!!! 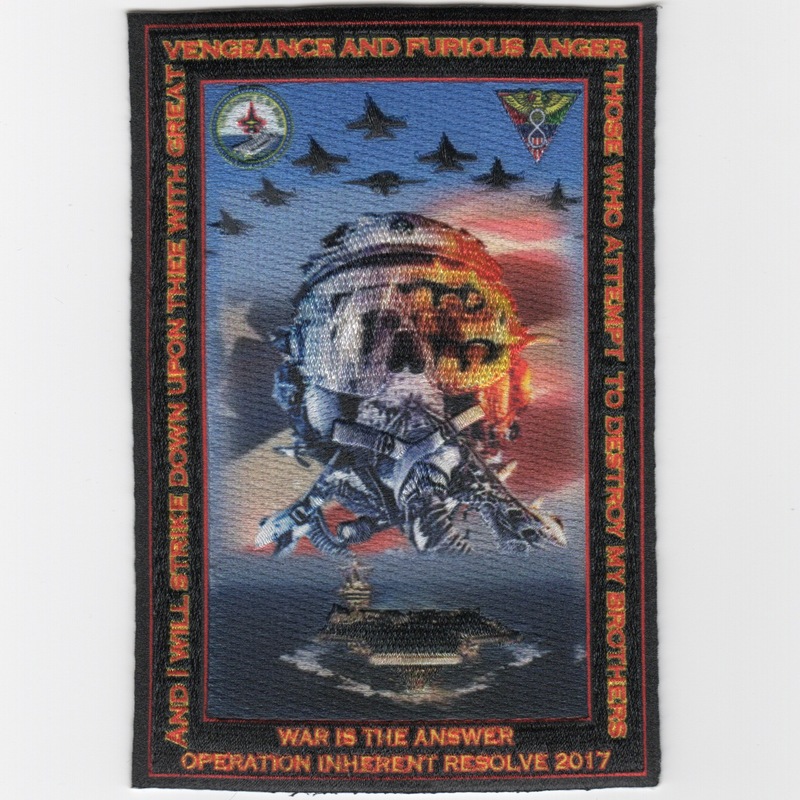 This patch was created for VAQ-131 and CVN-72 to commemorate their 2011 OEF/OND Combat Cruise. It shows the "gaggle" of Airwing squadrons and a setting (or rising) sun behind the "boat". This patch does not come with velcro already attached, but can send a piece if you need. 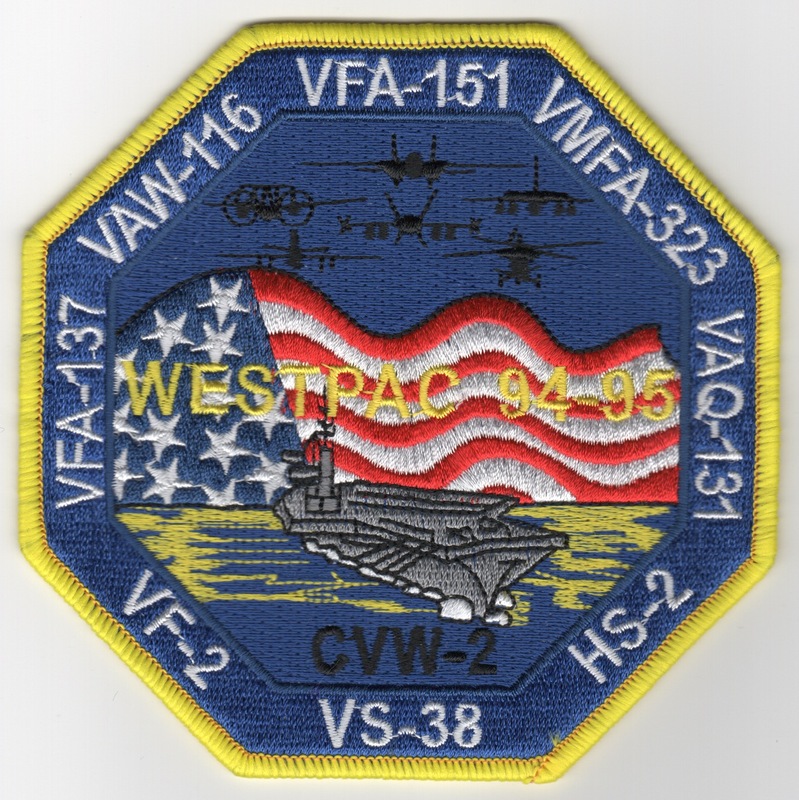 This patch was created for VAQ-131 and CVN-76 to commemorate their 2013 CONUS Deployment. It shows the "gaggle" of Airwing squadrons and says "A LOCAL FORCE FOR GOOD". 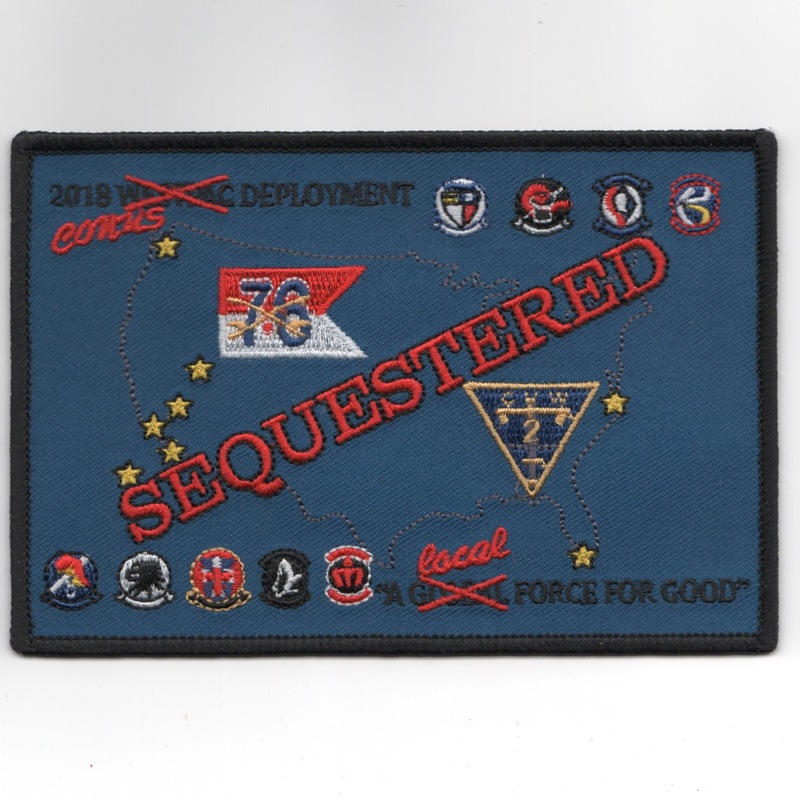 This patch was created by another vendor, but I was able to purchase all the remaining stock the squadron had to offer them to you. This patch does not come with velcro already attached, but can send a piece if you need. This is the green version of the "Greenie Board" chip that was used to award the pilots of that squadron their "landing grades". The "scoreboard" was hung in the Ready Room for ALL to see, so you really wanted to do well. VAQ-131 refurbished their "board" when they switch from Prowlers to Hornets and we were able to pick these items up from them directly. They are not seen very often, so get them while they last. The entire set is listed below. This is the red version of the "Greenie Board" chip that was used to award the pilots of that squadron their "landing grades". The "scoreboard" was hung in the Ready Room for ALL to see, so you really wanted to do well. VAQ-131 refurbished their "board" when they switch from Prowlers to Hornets and we were able to pick these items up from them directly. They are not seen very often, so get them while they last. The entire set is listed below. This is the blue version of the "Greenie Board" chip that was used to award the pilots of that squadron their "landing grades". The "scoreboard" was hung in the Ready Room for ALL to see, so you really wanted to do well. VAQ-131 refurbished their "board" when they switch from Prowlers to Hornets and we were able to pick these items up from them directly. They are not seen very often, so get them while they last. The entire set is listed below. This is the yellow version of the "Greenie Board" chip that was used to award the pilots of that squadron their "landing grades". The "scoreboard" was hung in the Ready Room for ALL to see, so you really wanted to do well. VAQ-131 refurbished their "board" when they switch from Prowlers to Hornets and we were able to pick these items up from them directly. They are not seen very often, so get them while they last. 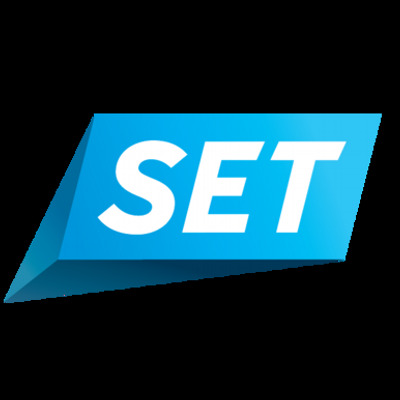 The entire set is listed below. This is the brown version of the "Greenie Board" chip that was used to award the pilots of that squadron their "landing grades". The "scoreboard" was hung in the Ready Room for ALL to see, so you really wanted to do well. VAQ-131 refurbished their "board" when they switch from Prowlers to Hornets and we were able to pick these items up from them directly. They are not seen very often, so get them while they last. The entire set is listed below. This is the entire set of all 5 "Greenie Board" chips that was used to award the pilots of that squadron their "landing grades". The "scoreboard" was hung in the Ready Room for ALL to see, so you really wanted to do well. VAQ-131 refurbished their "board" when they switch from Prowlers to Hornets and we were able to pick these items up from them directly. They are not seen very often, so get them while they last. The entire set is listed below. 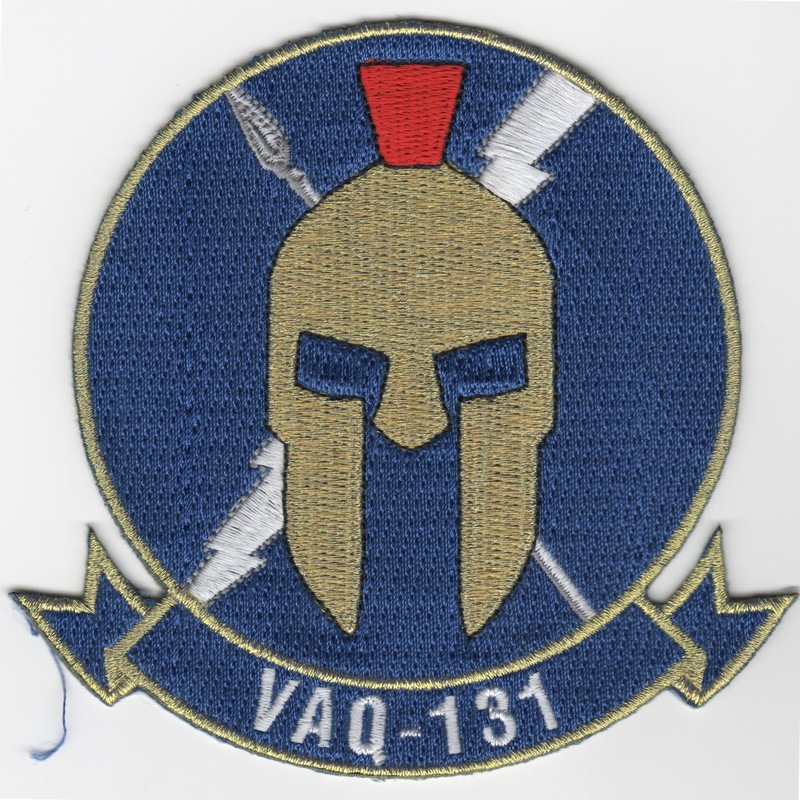 Homepage | Order VAQ-131 Patches!